Ask fellow campers about "Mound Valley COE" and nearby attractions. 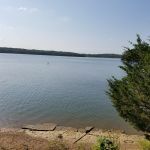 This COE campground is on a lovely lake with a hilly, heavily wooded shoreline. As we were locating our campground we ended up on narrow gravel roads which are in the process of being paved today. So, soon the paved roads leading to park will be a great improvement. My "9" rating reflects future paved roads outside park. The beach area is quite nice and very clean with abundance of good soft sand. There is a heavily shaded picnic area and shower house next to the sandy beach. When we reserved online we somehow didn't see that many sites have no water hookup. There are many areas to fill your tank throughout the park so this isn't a huge deal. The sites are paved and level and spacious. Many sites have a close view of the lake through the trees. Lake shore access by maintained footpath is available at every lakeside campsite. Patio is concrete with large, concrete picnic table. Verizon signal very good. One OTA TV station. This is a beautiful, out of the way, quiet campground near Hwy 400. Hidden gem. We want to return in the fall to see the lovely colors. We camped at Mound Valley COE in a Fifth Wheel. Swim at the beach. Hiking trails are available too. Campground roads are super for bicycling. Playground equipment in park. Fishing is good here. Lake large enough for power boats/skiing. Kayaking is great here, too. We stay in the Cherryvale section of the COE park for 2 weeks a month from April to Dec. There are full hookups on this side. Very clean, picnic table and fire ring on each site. Have group camping areas. Hosts are great, patrol twice a day. Sheriff's office patrols too. Been very happy camping here. We have a 40' fifth wheel and have plenty of room in most sites. Need a reservation weekends during camping season. Beautiful and quiet park. We camped at Mound Valley COE in a Fifth Wheel. Close to Cherryvale and Parsons. Parsons has Walmart, fast food and several restaurants. Several self-service ice machines with good prices. Park also has electric and water sites as well. We like this campground. It is like an Ozark area in Kansas. Sites are not close together and very shaded. 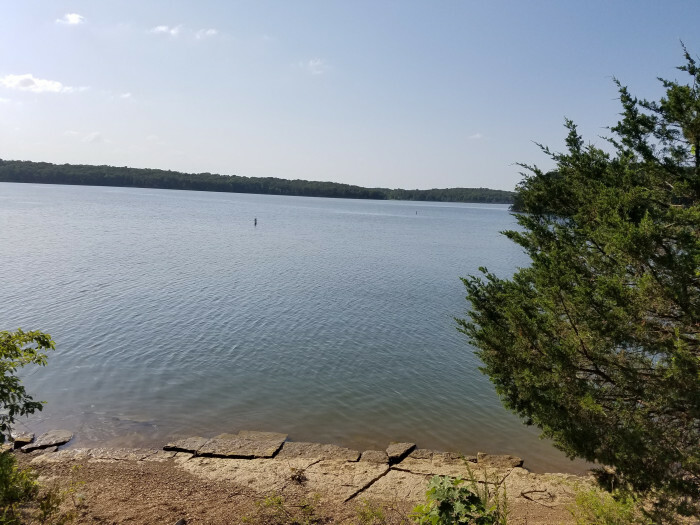 Some sites are on the water and we can leave our boat on a portable dock in the cove. Camp hosts are friendly and patrol the area twice a day as do the Labette County Sheriff's dept. 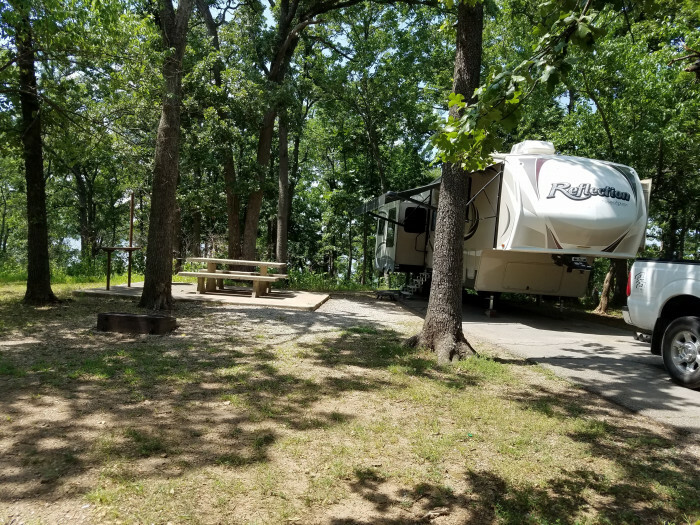 The area is clean and we enjoy the wildlife of deer that pass through the campground. 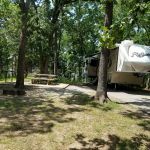 We camped at Mound Valley COE in a Fifth Wheel. We stayed here for two weeks while visiting relatives. We got one of the two sites with a sewer hookup. The site was beautiful and spacious. There was a table, BBQ, and fire pit and plenty of dead wood laying around for a fire. The only down side was the sewer connection was on the opposite side from the water and electric. There was a sewer site on that side but it was glued shut and unusable. Their rules only allow a 14 day stay and that is too bad. In the whole two weeks we only had someone else in the other site for two nights. The price reflects the golden age card which allows for half price. We would definitely stay here again. We camped at Mound Valley COE in a Fifth Wheel. The paved part of many of the sites was a little narrow and required some care in backing in but the campsite itself was spacious and not too close to its neighbors. We have a 30 ft class A. Most sites had electric, only two had water and sewer. There were many sites with beautiful lake views and close lake access, most had lots of trees. The restrooms were not very close to the site and the women's was locked when we were there so can't comment on them. We would stay here again. We camped at Mound Valley COE in a Motorhome. Are you affiliated with Mound Valley COE ?